Hi everybody! The sweet Ivana from Ivana Thinks Pink had asked me to make a guest post for her blog, I was so excited :-) Click here to check it out! wooow, you are the master of essence stamping plate! :) you always do it so perfect. but tell me is it still like that, that you have to buy a special polish to make the stamps? or could it be random polish? Lovely manicure, on my way to check out your guest feature! Hi sweety! I gave you an award on my blog, check it out! :D Btw; love your blog, you're doing a great job! ¡Qué manicura más elegante y original a la vez! 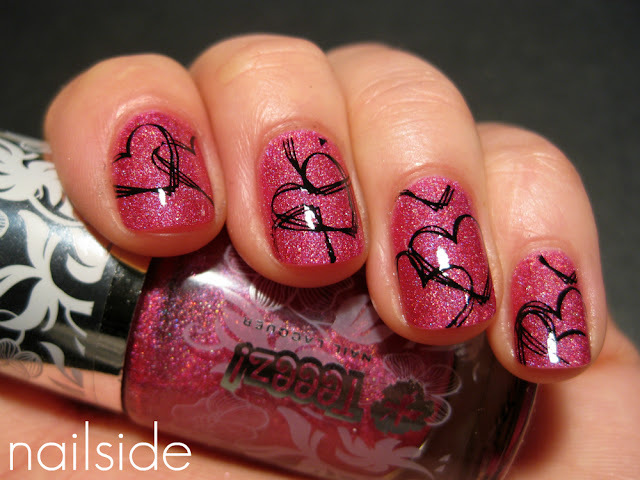 What a great stamping mani! I love the hearts! Very pretty! Love the heart, and also the Essence plate. Want it too! @daywoods2: Essence isn't sold online :'( I really wish it was, so many girls out there are dying to get their hands on some of their awesome stuff! The pink looks gorgeous! Is it a holo? How do you get your stampin to work?cant get it to take every time?